Never mind The Avengers or the seventh installment of the Star Wars franchise… some early stills from the big screen adaptation of Andy Weir’s The Martian have been circulating around ye ole web as of late, and we like what we see. Self-published in 2012 and lauded for its scientific accuracy, The Martian follows the exploits of astronaut Marc Watney (played by Matt Damon in the upcoming film) as he struggles to stay alive on Mars. Watney must rally every bit of scientific expertise at his command to accomplish everything from growing food to establishing communications to surviving the disco music and bad 70s TV left behind by fellow crew members. The 20 Century Fox film adaptation is directed by Ridley Scott (of Alien and Blackhawk Down fame) and promises to have a ‘successful failure’ vibe in the tradition of Ron Howard’s Apollo 13. Heck, reading The Martian, we simply love how it breaks the convention advocated at innumerable writing workshops that exposition is somehow always bad. Engineering and science geeks want to peek under the hood, and see what makes that warp drive tick. The Martian breaks very few rules when it comes to getting the science right, and there’s high hopes that this will translate well on the big screen. From the design of Watney’s Mars excursion suit to the expedition rover he uses to cross the Martian terrain, we’re seeing lots of actual NASA designs being incorporated into the production. One of our favorite bits from the book is where Watney must use the rising and setting of the twin Martian moons Phobos and Deimos for a rough dead reckoning while travelling over the open Martian terrain. It’s a terrific scene with some possibilities for some great panoramic vistas, and we hope it survives into the film adaptation. We also hope that the first NASA rover to roll across the soils of Mars (hint: it wasn’t Curiosity, Spirit or Opportunity) makes an appearance in the movie, as it did in the book. The current release date set by 20th Century Fox is November 27, 2015 and Mr. Weir noted that we may be seeing the very first trailers for The Martian very soon, possibly in the June time frame. And did you know? 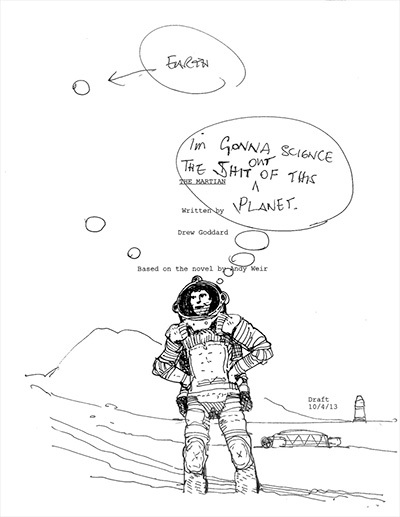 The cover for the script for The Martian—complete with early conceptual sketches by director Ridley Scott—actually flew aboard last year’s EFT-1 mission to test the Orion capsule in space. Unlike trendy dystopian futures that are all the rage these days, The Martian depicts an optimistic future, a time where budgetary woes have been overcome and humans are living and working on Mars. This may well have been the true reason that the novel resonated so well throughout the science and space community: it conveys a message of a future that we all hope will be a reality in our lifetimes. We even see a direct sci-fi lineage between The Martian and the classic 1954 science fiction tale The Cold Equations by Tom Godwin. The universe is indeed out to kill us, and only science can save the day. It’ll be interesting to see if The Martian becomes the breakout hit of 2015. Also starring Michael Pena, Mackenzie David, Sean Bean, Donald Glover, Kate Mara, Sebastian Stan, Jeff Daniels, Chiwetel Ejiofor, and Jessica Chastain, The Martian features an all-star cast. We’re also curious to know if the film will have a disco soundtrack, but the author isn’t telling. Much of the Mars-scapes for The Martian are being filmed in the deserts of Wadi Rum in southern Jordan. We traversed this region during our global backpacking trek in early 2007 and can attest that it is suitably Martian in appearance, though of course, we’ve yet to journey to the Red Planet… Weir’s book and the upcoming film will have to suffice for now. Wadi Rum also simulated Mars in the films Red Planet and The Last Days on Mars. We’ll definitely be waiting in line come opening day! See more images from The Martian courtesy of Empire, Entertainment Weekly and People magazine. I can recommend the audiobook, it is well produced. And one gets more out of a movie if one has read the book first. (At least more irritation over what has been left out or changed). I wonder if any movie expert here can see any significant differences from the book, in the casting or the images released? Is there for example a chain of habitats behind that mega rover? I don’t remember that from the book, but I don’t have the text to compare with.